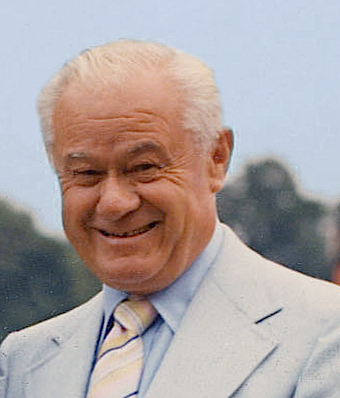 Trainer Lucien Laurin was usually the quietest member of the Secretariat team. While owner Penny Chenery and jockey Ron Turcotte talked easily with the press and public, Laurin stayed out of the limelight, quietly keeping his mind on the business of training horses. A little guy, with a quick smile, Laurin had grown up on the bush tracks of Canada, then made it big on the biggest racing stage in New York. He didn’t give away any secrets about training racehorses, and he didn’t chatter on and on about how he molded the greatness of Secretariat. It wasn’t like Laurin didn’t speak. He wasn’t as silent as Silent Tom Smith, with Seabiscuit, say. Or as grumpily closed-mouthed as Frank Whitely, with Damascus. But he followed a long-established turf tradition of holding your cards close to the vest. A reporter with an open notebook at Laurin’s barn didn’t hear much to use in a newspaper column. But you could get an idea. First of all, Penny Chenery trusted Lucien Laurin. That says a lot right there. When Chenery was suddenly forced to take over the failing fortunes of Meadow Stable from her ailing father, Christopher Chenery, she needed a trainer she could count on. Someone who could accurately evaluate the horses in the stable, train them correctly, and help her navigate a complex sport. She needed an inside advocate in an insider’s game. And Laurin was just that person. And it worked the same way for the trainer. Laurin, then 59, had been all set to retire when the Chenery job came along. Lucien’s son Roger Laurin had recently taken over as trainer of the Chenery family’s Meadow Stable horses, but now was leaving to train for the Phipps family and Wheatley Stable, considered the No. 1 outfit in the sport. The son recommended his father. For Lucien Laurin to cancel retirement plans to orchestrate a turn-around in the fortunes of a high-profile stable that had fallen on hard times, well, that was asking something. Just as the owner needed a trainer she could trust, so, too, the trainer needed an owner who would back his play. 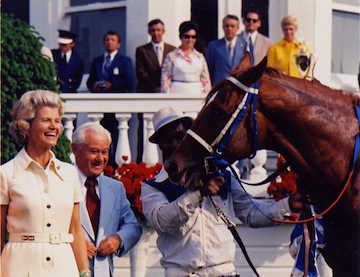 And that was Penny Chenery. Laurin also needed horses that could win. Trainers can’t make horses run faster than they’re able, just as jockeys can’t carry their mounts across the finish line. Meadow Stable needed runners, and the Chenerys’ farm, The Meadow, in Virginia, hadn’t been producing the kind of talent it had in the past. But then it did. A colt named Riva Ridge arrived from the farm, and hit the track running. Riva Ridge was a son of Meadow Stable sire First Landing, who had won 19 races, and been named two-year-old champion. His dam was Hildene, a star Meadow broodmare. In his first season, Riva Ridge won five stakes races and was, like his sire, named racing’s 2-year-old champion. At three, Riva took the Kentucky Derby and Belmont Stakes. Of course, that’s how horse people always hedge their hopes. Penny was thinking the same thing. But they all had to wait. Lucien Laurin was born in Joliette, Quebec, near Montreal. He came on the turf as a jockey, with modest success, then shifted to training horses in 1942. He trained first on the New England circuit, where he caught the eye of prominent New York owner Reginald Webster. Webster supplied Laurin with well-bred stock, and the pair clicked with several top horses, including the champion filly Quill, and a colt named Amberoid, who upset Kauai King in the 1966 Belmont Stakes. When Laurin took the Meadow Stable job in 1971, he brought with him the skilled hands of groom Eddie Sweat and exercise rider Charlie Davis. That pair also formed a traveling team for Laurin, vanning stable stars to tracks in other cities for important races. Henny Hoeffner was Laurin’s stable foreman. 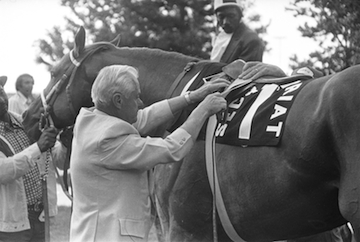 Mordecai Williams was Secretariat’s first groom, and Jimmy Gaffney the colt’s first skilled exercise rider. With all that experience and expertise around the barn, the Laurin operation ran smoothly. Didn’t make many mistakes. So when the Big Horses came along, Laurin delivered. Riva Ridge was a nervous horse — tall, thin and edgy. A finicky eater. But he skipped swiftly over the track. Secretariat, of course, was nothing like that, at all. Big, strong, poised, sure of himself – and powerful. Ate everything in sight. His feet hit the ground hard, dug in and pushed off. That Laurin could handle such opposite types was a credit to his talents, and his instincts. Thoroughbreds don’t come all the same, and they can’t be hammered into set routines. The soft-spoken French-Canadian trainer could also handle the pressure of intense public and media interest, which built as Secretariat dashed through his two-year-old season, and was named Horse of the Year. Secretariat wasn’t just a racing star, he was becoming a name familiar to the general public. A horse people heard about, even if they never followed racing. Secretariat made news off the track, as well. A he turned three and was being pointed for the Kentucky Derby and the Triple Crown, he was syndicated for a future stallion career for a world-record $6,080,000 — suddenly, the most valuable horse in history. And the owners of syndicate shares weren’t merely investors, but almost all successful racing people. Kings of the Sport of Kings. Many of them had ideas on how the horse should be handled coming to the Derby, and throughout his racing career. Famous names, whose opinion commanded respect. But Laurin, backed by Chenery, shooed them away. The trainer stayed in charge of the horse and trained Secretariat exactly as he thought best. And why not? Maybe there was an advantage for Laurin in that he had already enjoyed a fine career. He’d been talked out of retirement, and now had his hands on a possible horse of the ages. That doesn’t mean Laurin didn’t worry. He was a nervous-kind of guy, anyhow, and trainers ALWAYS worry about their horses. But the limelight didn’t bother him. Turcotte told Laurin that he didn’t like Secretariat’s first work after the Wood. The rider thought something was bothering the horse. 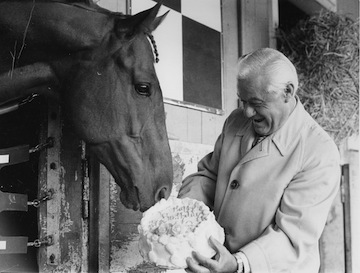 Laurin called in noted veterinarian Dr. Manuel Gilman, who located an abscess in Secretariat’s mouth. Gilman suggested a normal remedy, and Laurin and groom Eddie Sweat applied the necessary horse-care know-how — and the patient soon recovered. Back to his old self. “In his final work (before the Kentucky Derby) he really flew,” says Turcotte. And Secretariat kept right on flying at Churchill Downs, zooming from last to first to win the Kentucky Derby in track record time of 1:59 2/5 for 1 ¼ miles – the first Derby clocking ever under two minutes, and still the Derby record. Not that the trainer got to breathe a big sigh of relief. The pressures of a Triple Crown attempt ratcheted up the interest in Secretariat. It had been 25 years since Citation had swept the Kentucky Derby, Preakness and Belmont in 1948 – a quarter century since a horse had been able to do it. And now people were talking about Secretariat winning it like it was almost a sure thing! But once again, Laurin was merely hedging against hope. Laurin got to keep his “book,” a schedule of upcoming races that every trainer carries around, and Secretariat, of course, ran right into history. Still, Laurin fretted. Some years later, Chicago Tribune turf writer Neil Milbert talked with Laurin about Secretariat’s famous Belmont victory. Laurin detailed his emotions as the Secretariat team watched their horse seize the lead early in the 1 ½ miles Belmont. “When I saw how fast (Secretariat) was going on the backstretch if I had a gun, I’d have shot Ronnie Turcotte!” Laurin told Milbert. “I told Mrs. Tweedy, ‘We can never win now; he won’t have anything left.’ But he kept going and he went faster all the time. “Ronnie never really asked him — he hand-rode him, and never went to the whip,” said Laurin. “I couldn’t believe it, and neither could Ronnie when I talked to him afterward.” Secretariat completed the 1 ½ miles of the Belmont in an American record 2:24 clocking, with an ever-widening margin. The Daily Racing Form later was able to establish Secretariat’s winning margin as an astounding 31 lengths in front of second-place Twice A Prince. (By the way, nobody can actually see 31 lengths and know that’s the number, as an announcer does in the movie “Secretariat.” It has to be pieced together by looking at film of the race.) Secretariat’s 31-length victory eclipsed the 25 lengths Count Fleet had won the Belmont by in 1943. Chenery says Laurin understood Secretariat as an equine athlete. “I’ve always thought Lucien was the perfect trainer for Secretariat,” Chenery told the Louisville Courier-Journal, “because Lucien was hard on his horses and he liked the horse he could really put the work to. And that’s what Secretariat was. If someone else had been afraid to stretch his limitations, we might not have found out what Secretariat was. He might have just stayed a fat, lazy horse. Lucien’s temperament, and the way he liked to train a horse, just suited Secretariat. Such was the magnitude of Secretariat that it is possible another gifted trainer could have done as well with the horse. But it is difficult to imagine anyone could have done better. The record is there. And Laurin, himself, knew he’d been lucky that a one-in-a-million star had come his way.